"The land itself, 'the gift outright' as Robert Frost called it [see poem below], has been the most enduring and truthful presence in American life. In spite of our abuse of its resources and our profanation of its spirit, it is yet and always a great, unyielding, mystical silence. A people nurtured by its presence will be a people with a sense of grandeur, and a people incapable of small ambitions or conceptions. Even their sins will be touched by its presence, and be given vitality thereby. Instead of having time and tradition as the most pervasive influence on our lives, we must come to grips with nature and space. That is to say that we confront directly the universe in the rawness and immensity of its life. We have come with whatever personal history we have, but as Americans we know in our bones that it is not enough to affirm our father's house, that indeed it is not possible to affirm a single stream of life until we have stood alone in space and affirmed the entire process. It is impossible to be an American in any deep sense without being a visionary and a mystic, without feeling the whole of human history as a mystic presence, and without having a mystic vision of the future." To read about Erling Duus (Christensen), go to Honduras This Week. in the November 20, 2000 Readers' Forum of HTW. Erling Duus Christensen* is a Danish-American who was born in South Dakota. He is the author of Danish American Journey, American Christianity and the American Earth, The Tragic Sacred Ground, and Jesus Walks in the Garden of the Parque Central and Other Honduran Essays. Erling has also worked as a humanities teacher in American colleges and universities, as founder of the Tree of Life Ministry on the Rosebud Indian Reservation, as a folk school director in the Black Hills, as a theology professor in Peru, as a secondary school teacher in Belize and Honduras, as a clergyman, actor-director, newspaper columnist, and as a political activist. 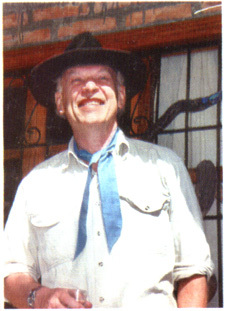 Two months following his return to the U.S. from Honduras, Erling died on October 17, 2000 after a brief but spirited battle with colon cancer at his brother's home near Gallup, New Mexico. His book called The Quiet Revolution and other Honduran Essays, which contains additional articles he wrote for the newspaper "Honduras This Week," was published in 2002. *Editor's note: In his later years Erling followed the Central American custom of using his mother's maiden name last. Cover art work: Danish-American and Nebraska artist F.W. Thomsen's rendering of the Black Elk-Neihardt vision, the Tree of Life flowering within the sacred circle at the Center of the Earth.